Continuous manufacturing has been the norm for a variety of industries for decades. Manufacturers appreciate how the uninterrupted processing of materials, with little to no shutdowns, is both cost-effective and practical, resulting in consistent quality and efficient operation. Industries such as packaged goods, paper, excipients and oil refining have long benefited from continuous manufacturing and have well developed technology that can completely automate and monitor processes from raw materials to finished products. The pharmaceutical industry, however, has been slow to take the advantages of the technology for various historical reasons. “For decades, most drugs have been manufactured using what is known as ‘batch’ technology — a process whereby the ultimate finished product has been made after many stops and starts in a series of steps. Unfortunately each break in the process causes inefficiency and delay, as well as the increased possibility of defects and error,” said Dr. Lawrence Yu, U.S. Food and Drug Administration’s Deputy Director, Office of Pharmaceutical Quality, Center for Drug Evaluation and Research. In order to advance the consistency of medicines quality at lower costs for patients, as well as to resolve potential drug shortages and more quickly respond to sudden changes in medicines demand (e.g. epidemics), the U.S. Food and Drug Administration (FDA) has been very interested in supporting the growth of pharmaceutical continuous manufacturing (PCM). As more and more drug makers adopt PCM in drug manufacturing, new technological developments and operational demands are resulting from new partnerships among academic centers and industry leaders, particularly in the past two years. As with all emerging technologies in complex fields, questions and challenges are now being brought to light, including the need for common standards of quality for this technology. In 2016, USP hosted a roundtable workshop about PCM in collaboration with the Center for Structured Organic Particulate Systems (C-SOPS), a leader in research on PCM. As an outcome of this workshop, USP formed an Expert Panel on PCM. The expert panel, which includes experts from academia, industry and regulatory bodies, held its first meeting in January 2017. Topics of discussion included the panel’s role and responsibilities, as well as opportunities for USP to assist in PCM technology improvement through the development of quality standards. As one of its first efforts, the expert panel is working to standardize terms used in PCM and characterize materials that are specific to PCM. To formalize the collaboration between USP and C-SOPS, leaders from both organizations signed a memorandum of understanding (MOU) in February 2017. 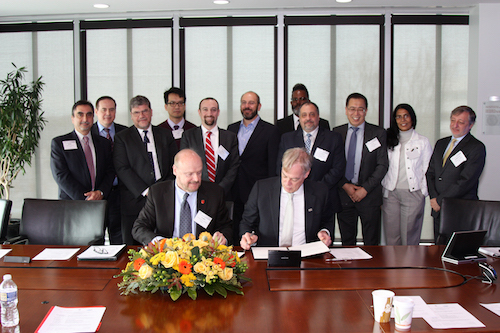 At the signing event, C-SOPS and USP leaders emphasized the importance of making the PCM technology more affordable and widely available to manufacturers around the world. Future planned activities for USP include exploring the development of solid dosage standards for PCM, hosting workshops internationally to introduce PCM to critical markets and learn about advances in the field, possibly establishing collaborations with other leaders in PCM. We want to hear from you. What are your thoughts on the promise of continuous manufacturing and the important role of quality in protecting people's health? Leave your comments in the space below.